To me, these vessels are works of art, a masterpiece. I have wanted shoes like this forever. They speak to me of tomboys, denim and badass poets, classic footwear hovering on the verge of preppy. But not quite. Eventually, with worn heels and holes, they will smell of grunge band, fast times and flannel. There is something infinitely satisfying about wearing this symbol on the sidewalks of suburbia. I have never been in style. Grocery shopping with my mom at our local A & P comes to mind, as I stared at the Dr. Scholl’s display in the same aisle with the hairnets and Legg’s eggs. I was 16 and lusting after those sandals with smooth leather straps (in three different colors!) and a neat center buckle. It seemed like everyone wore them, wooden soles clattering down the high school hallways and clacking nervously under classroom desks. I could only stand by as spectator, fascinated by how the teenage fashionistas kept those clog-like wonders on. My mother caught me salivating and dismissed my dreams of finally becoming cool despite my bottle-bottom eye glasses and overall nerd status. “They’ll hurt your feet,” she warned me and that was that. This from a woman whose toes were molded into torpedo points by those hellish heels of the 50s, a style providing countless numbers of foot surgeons with lifelong job security. “But they are supposed to be good for your feet. They EXERCISE them,” I argued, reading from the box. And long. Size 10, to be exact. That’s all well and good for a 6’2” runway model, but my 5’8” frame only allowed me to be cast as the family’s personal Bigfoot (a term my father affectionately used for me). Unfortunately, I possess the trifecta of podiatric woes: narrow, long and flat as a pancake. While my archless-ness might keep me out of a wartime draft, I would gladly endure boot camp than suffer the humiliations of a footwear gauntlet (otherwise known as the shoe store). Ah yes, the dreaded yearly trip to the small-town shoe shop, where I would gaze sadly at a limited assortment of beautiful styles I could not wear. Right off the bat, my mother ruled out anything remotely cute or trendy, nothing with heels, absolutely no flimsiness or slip-ons allowed. That left a few sturdy crepe-soled lace ups in geriatric browns and tans. If Velcro shoes had been popular then, I’m sure they would have come in a close second (nothing with flashing lights or wheels in the heels, however). Come to think of it, Velcro would have made the torment go a whole lot faster if not easier, as I sat tensely through the everlasting lacing procedure at the knee of the store owner, who had realized by this point there wasn’t one shoe in the entire store that fit me. We’ll just have to “special” order them. I hate the word special. After what seemed like years, we returned to the scene of the crime for the prize I didn’t want. And the “specially” ordered size 10s wouldn’t fit much better than the store’s one pair of 9 1/2s, except that my toes weren’t as crowded (obviously my mother’s worst nightmare) and I could easily walk out of my new giant boats of leather without untying any laces, thanks to the narrow heels blessed to me by my grandmother. 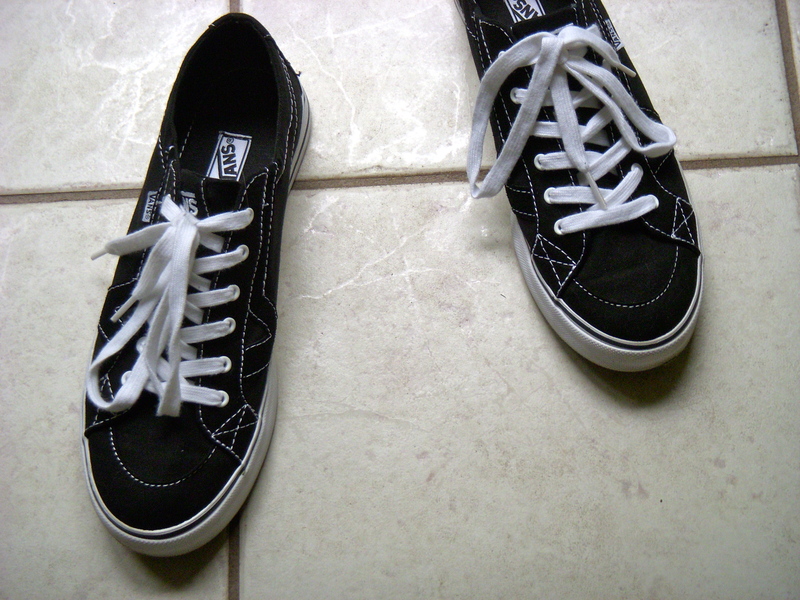 Now, flash forward to the brand-new Vans, the cool ones here in black and white. The ones I bought in record time after waltzing into the shoe section of a regular department store, zeroing in on the display model, quickly searching through the well-marked boxes, and finding just the right size (already pre-laced). I tried them on by myself, no exhausted sales clerk hoping against hope that this trial of patience would soon be over, no mother following me around with her toe-seeking fingers at the ready, and no customer service associate painfully filling out an order form for my mythical pair of perfect shoes. And the best part? They are a size 9 1/2. Either I have shrunk or American shoe standards have grown large. Oh joyous day, this means there are plenty of other big-footed gals out in the fashion wilderness. I am not alone. And yes, Mom, I have plenty of room in the toes. Now you need an army surplus jacket with illegal insignia, a few flowers in your hair, and a bus ticket to San Francisco. I had my eye on some purple plaid ones with matching purple laces, but they just didn’t fit (same old story). Somehow, I think our midlife is going to look a little different from our mothers’ go-round. Who knows, maybe I’ll take up skateboarding next? Lovely to meet you Elaine. Thanks for commenting and enjoy those cool shoes! Hi Meg! I agree — I am very thankful for the variety these days. I have the luxury of choosing the most comfortable from many, an embarrassment of riches. I bet those plaid All Stars look great on you! I saw the ones without laces but I was afraid I’d walk right out of them. Maybe I’ll try them on sometime. Have a great weekend, and enjoy this lovely fall weather! Oh you brought those dreaded corrective shoes memories back! The cutest shoes I had in school were my gym shoes (sneakers) and I’d change into them as soon as I got to school and had to remember to change back to the heavy ugly oxfords on the bus ride home. One of the joys of becoming an adult for me was shopping for shoes. Sorry to bring up the unpleasant memories, but I’m glad you have good shoe days now. There’s another bonus to being an adult! I’m enjoying your blog The Honey From the Bee. Thanks for stopping by, Janet. I too hated the shoe store when I was younger. Wait, who am I kidding, I still hate it. It’s ironic that I’d long to have the size 10 feet of my youth back. I ended up with size 11s and let me tell you, it’s even more impossible to find. Size 10 seems to be everywhere these days. My uncle’s hilarious joke when I was young is that the family could go shoe shopping and I could just wear the shoe boxes, ha ha!